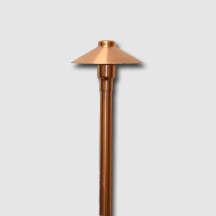 The TLSCPL Path Light showcases a simple contemporary design with the sturdy construction of copper. The wide selection of finishes available allows this fixture to subtly blend into any landscape or lawn design. Constructed of natural light weight copper, it comes standard with a 12” or 18” tall, ½” NPT stem, mounting stake, and adjustable frosted glass lens. Provided with a 3’ long 18 ga. whip and low voltage connector. The fixture can be finished with a durable polyester powdercoat paint, left unfinished to patina naturally, or provided with a factory applied patina finish.